The King�s Indian Defence is one of Black�s most dynamic and aggressive responses to 1.d4. A favourite weapon of both Fischer and Kasparov, it remains a popular choice at all levels of play. 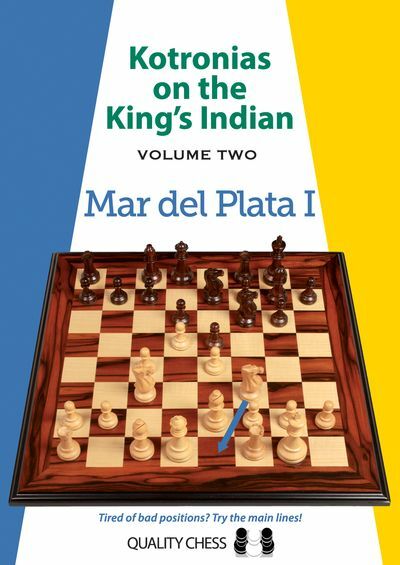 In this, the second volume of the Kotronias on the King�s Indian series, grandmaster Vassilios Kotronias turns his attention to the main line of the famous Mar del Plata variation, which arises after the opening moves 1.d4 Nf6 2.c4 g6 3.Nc3 Bg7 4.e4 d6 5.Nf3 0� 0 6.Be2 e5 7.0� 0 Nc6 8.d5 Ne7 9.Ne1. This leads to some of the most complicated and theoretically challenging positions in the King�s Indian, but Kotronias provides a world-class repertoire for Black, including a wealth of original ideas and analysis. Vassilios Kotronias became Greek Champion for the tenth time in December 2014. He is feared for his profound opening preparation, and is one of the world�s foremost experts on the King�s Indian Defence.